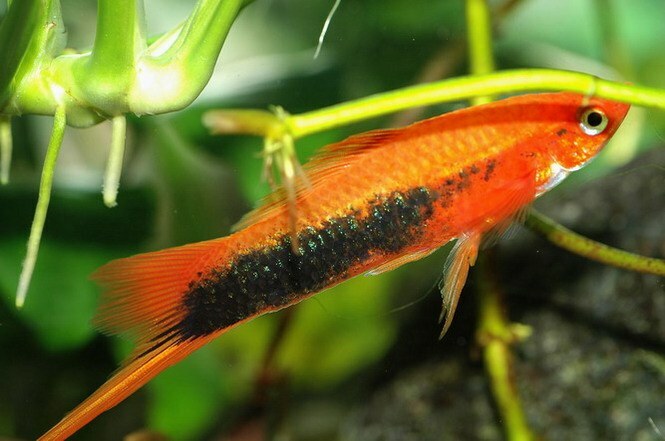 A few hours after birth, the fry swordtails are quite independent and need food. Theoretically, algal plaque, available in the aquarium can suffice them for a day or two. However, remember that feeding the fry in the first days of life, influencing their further development. Therefore, the approach to drawing up a "menu" it is necessary very seriously. To feed fry , it is recommended 5-7 times a day in small portions. In the first half of the day it should give food 3-4 times with an interval in 1-1,5. You can then make a three-hour break. Increase the interval of feeding in the second half of the day to 2-2. 5 hours. In the future, the number of feedings can be gradually reduced. For feeding you can use or a homemade mixture. Typically, the first food for the fry becomes a "living dust" - tiny organisms that live in ponds. In "menu" it is recommended to enable the nauplii of Cyclops, rotifers, water "hell". In warm time of the year to make a "living dust" can be your own. Take a container, fill it with water and leave it on the street for 1-2 days. Take a strainer and gently collect mosquito larvae and other insects. Allowed the use of frozen feed similar in composition to the "living dust". However, their nutritional value is slightly lower than that of the living. You can also use a special dry food, combining it with the plant. However, professional aquarists use a ready-made dry food only as a supplemental feeding. If you are, for one reason or another, did not have time to stock up on prepared food, or the necessary ingredients for the preparation of the mixture, then, for the first feedings, you can use egg yolk. Boil eggs in steep and let it cool. Remove the yolk and break off a small piece. Hold it between your index and bolim finger, dip it in the water and carefully RUB. The resulting "dust" will serve as a good food for young. Keep the yolk should be in the refrigerator, maximum 3 days. Also for "emergency" feeding you can use egg and milk powder and dry milk. Often enough to supply the fry swordtails bred ciliate-shoes. Introduction in the diet of this microorganism accelerates the development of fish, improves growth and makes them move actively. Boil and cool two liters of water. Pour into a jar and put a banana peel. Place, away from direct sunlight, for 3-4 days in a bright warm place. First, the water in the pot turbid and begin to emit a sweet odor, then again will become transparent. Thereafter, the resulting solution is slowly added to the aquarium with a syringe or spoon. The growth of fry feeding on larger food. From the second week you can enter in the diet of finely chopped brine shrimp, bloodworms and Tubifex. An hour after feeding the fish should be thoroughly clean the bottom of the aquarium with a thin hose, collecting the uneaten food, and replace some of the water. Aquarists – people are busy. Not only that, they have to observe strictly the time of feeding fish, and constantly clean the aquarium, change the water in it and decorate it, as resources permit. And if there is a fish and offspring – and then trouble increases. Check whether a well-lighted aquarium. 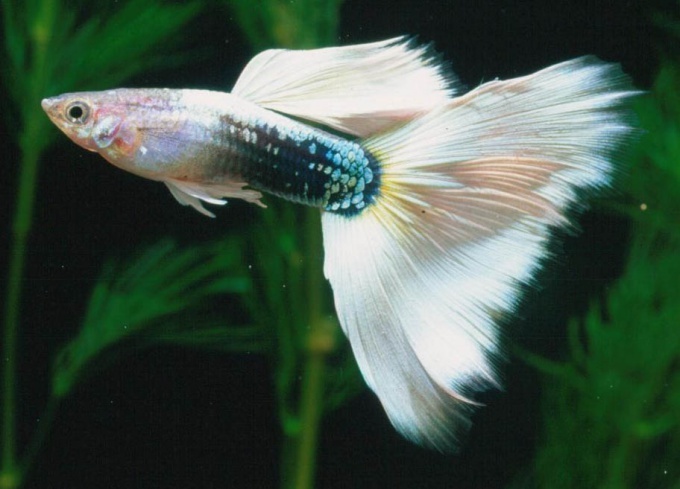 And adult guppies and the fry need as much light as possible. In the first days of life fish the lights in the aquarium off the clock. Purchase, gather or grow in the home live food for the fry in advance. Do not feed them dry food. First, it is difficult to immediately determine the amount, and second, the excess forage can form on the surface of the water film, and third, this food is still too rough for them. For dry food, they can be converted when they get a little older. During the 1st week of life to feed the fry should be 4-5 times a day, on the 2nd and 3-4. Up to 1,5-2 months the fry should be fed at least three times a day. If you are difficult to carry out almost all the time at home, try to set up an automatic feeder, but remember to remove the remnants and to ensure that feed was enough for everyone will own you. Best fry feed "dust" (rotifers, all nauplii and Cyclops) or microcephaly, grown on pureed carrots. Finely crushed bloodworms, Tubifex or nematode fry can be fed not earlier than the 2nd week of life, only a very short time and in extreme cases. Instead of live feeds of hopesick you can nurse pounded almost to dust the egg yolk (or scrambled eggs), yogurt, grated on a fine grater cheese. But using them is only as foods. Please note: from egg yolk, the water in the aquarium becomes cloudy, it is better to give the fish any other bait. Pour the yogurt with boiling water, wait until curdle the protein, and catch it with a butterfly net. Lower net protein into the aquarium and gently shake until it forms a cloud of small particles of food. Cheese (or milk) is poured in the aquarium as well as any other food.